My research focuses in the application of Geoinformatics in environment, marine, health and agriculture fields. I also work on development of wireless GIS using the concept of Internet GIS and wireless devices such as wireless LAN, personal digital assistant (PDA) with mobile phone (GPRS). This technology has been used for real-time spatial data logger and also air-pollution monitoring. 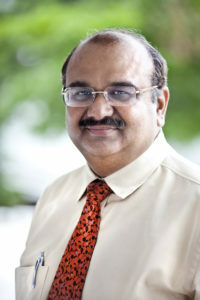 Tripathi, N.K., Siddiqi, M.U. and Gokhale, K.V.G.K., 2000, Directional morphological image transforms for lineament extraction from remotely sensed images, International Journal of Remote Sensing, Vol. 21, No. 17, pp 3281-3292. Tripathi, N.K. and Rao, A. M., 2001, Bathymetric Mapping in Kakinada Bay, India, using IRS-1D LISS-III Data, International Journal of Remote Sensing, Vol. 23, No. 6, pp 1013-1025. Rajapakse, R.M.S.S., Tripathi, N.K., and Honda, K., 2002, Spectral Characterization and LAI Modeling for the Tea (Camellia sinensis (L) O. Kuntze) Canopy, International Journal of Remote Sensing, Vol. 23, No. 18, 3569-3578. Patil, A.A., Annachchatre, A.P., and Tripathi, N.K., 2002, Comparison of conventional and geo-spatial EIA- A shrimp farming case study, Environmental Impact Assessment Review, Vol. 22, 361-375. Daniel KW, Tripathi, N.K., Honda K, 2003, Artificial neural network analysis of laboratory and in situ spectra for the estimation of macronutrients in soils of Lop Buri (Thailand).Aust. J. Soil Res. Vol. 41, 47-59. Tripathi, N.K., and Vasan, C. 2005, Open GIS based wireless data logger for flood mitigation, Role of water sciences in trans-boundary river basin management, Ed. By Dr. S. Herath, Dr. Dusmantha Dutta, Dr. A. Dasgupta. Published by: United Nations University, Asian Institute of Technology, 75-80. Onprapha P., Tripathi, N.K., and Dutta, J. 2005. Air pollution monitoring and GIS modeling: a new use of nanotechnology based solid state gas sensors, Journal of Science and Technology of Advanced Materials, Elsevier, Vol. 6, 251-255. Kanchana N. and Nitin Kumar Tripathi, 2005. An information value based analysis of physical and climatic factors affecting dengue fever and dengue haemorrhagic fever incidence, International Journal of Health Geographics, 4(13), 1-13. Daniel K .W., Tripathi, NK, and Honda K, 2006, Development of Spectral Band Cloning Techniques for Estimating Soil Nutrients, International Journal of Remote Sensing. Vol. 27, Nos. 18-20, 4213-4225. Hung, N. Q., Babel, M. S., and Tripathi, N.K., 2008. An artificial neural network model for rainfall forecasting in Bangkok, Thailand, Hydrol. Earth Syst. Sci., 5, 183-218. Chalermchai, P., and Tripathi, N.K., 2008, AHP based Flood Water Retention Planning in the Chi River Basin, Thailand, GIScience & Remote Sensing, 2008, 45, No. 3, p. 1–13. Hossain, M. Z., Tripathi, N.K., and Gallardo, W., 2008., Land Use Dynamics Due to Natural and Human Induced Factors in a Marine Protected Area System During 1976 – 2005 in Lower Andaman Coast of Thailand, Journal of Coastal Research. Nakarin Chaikaew, Nitin K Tripathi and Marc Souris, 2009. Exploring spatial patterns and hotspots of diarrhea in Chiang Mai, Thailand, International Journal of Health Geographics. Vol. 8, No. 36, 1-10. Suwisa M., Tripathi, N. K. and Honda, K., 2009. Sea surface multispectral index model for estimating chlorophyll-a of productive coastal waters in Thailand, Canadian Journal of Remote Sensing. Jeefoo, P., Tripathi, N.K., and Souris, M. (2011). Spatio-Temporal Diffusion Pattern and Hotspot Detection of Dengue in Chachoengsao Province, Thailand. Int. J. Environ. Res. Public Health, 8(1), 51-74. S. Qasim, R. P. Shrestha, G. P. Shivakoti, N. K. Tripathi, (2011) Socio-economic determinants of land degradation in Pishin sub-basin, Pakistan. International Journal of Sustainable Development & World Ecology, Taylor and Francis.